We’re truly in the throws of one hot summer here. 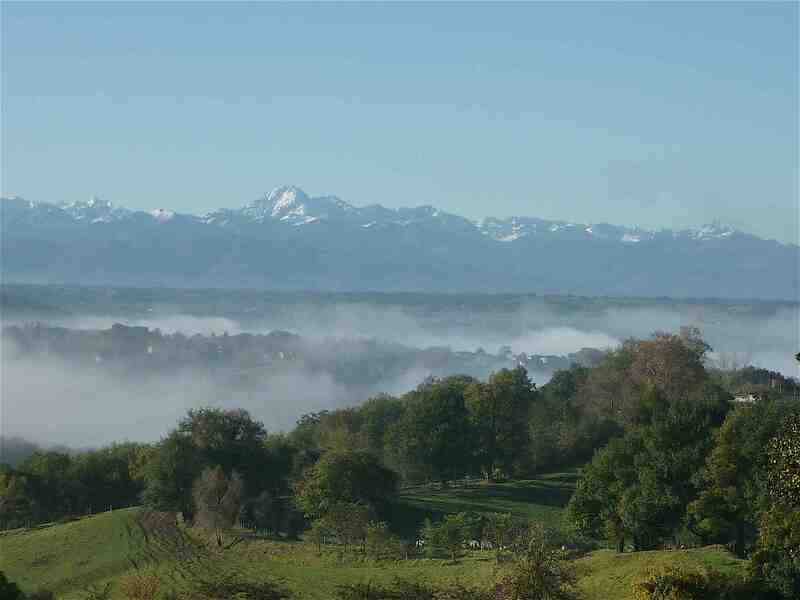 And for once the UK seems to be matching the glorious South of France climate too, hooray …. but please may it last through to August when I shall be descending on the homeland to, fingers crossed, bask in the delights of an English summer for the first time in many years!. Unlikely, but one can live in hope. I’d like to say the fabulous weather has brought on a spate of barbecues at Chez Foti but to be honest there simply hasn’t been the time with everything else that’s going on. But we did manage a lovely one last Saturday with an assortment of Kebabs, Satay Sticks and Salads. Very much enjoyed by all and both kids happily munched away. 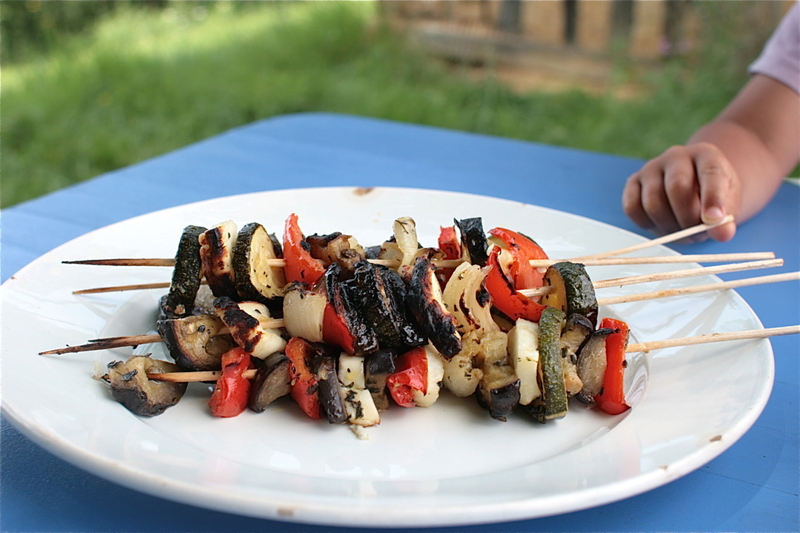 I LOVE Halloumi on a barbie and it makes for a fab veggie kebab. And as I recently discovered my kids like it too it’s sure to become a bit of a regular round here, though they’ll have a fight on their hands for it with me! Since Halloumi doesn’t take long to ‘cook’, more like brown, I suggest you either bbq it with quick-to-cook veggies like cherry tomatoes, finely sliced courgette ribbons and mushrooms OR like me with a pre-roasted selection of slightly longer-to-cook veggies, namely red peppers, aubergine and thickly cut courgette. Obviously the roasted veggies can be prepped in advance, so all you need to do pre-barbie is thread them with the Halloumi on to skewers. Seeing as I’m hosting this month’s Four Seasons Food with a Barbecue and Barbecue Side theme I shall of course be entering this post! Also to Karen’s Cooking with Herbs Challenge. 1. Pre-heat your oven to 200ºC. 2. 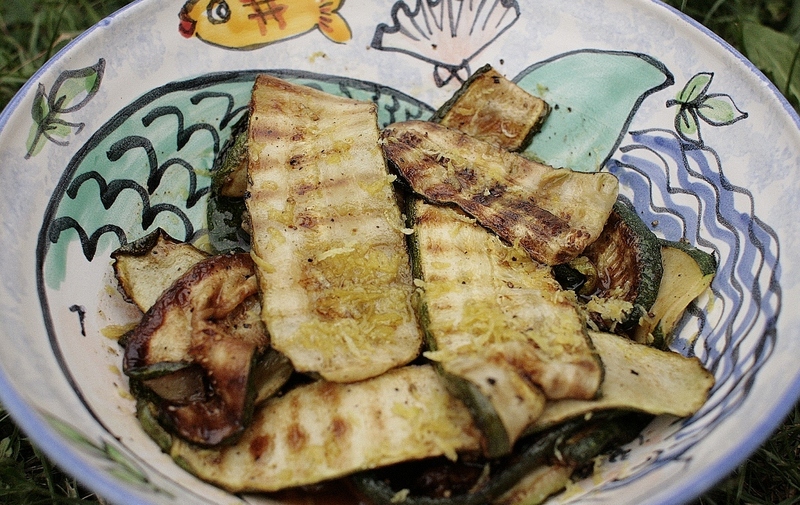 Slice the courgette into 6/7mm slices and cut the pepper and aubergine into similar sized chunks. Cut the onion in half, then each half into quarters. Half each of the quarters and separate the layers to roughly match the thickness of the veggies. 3. 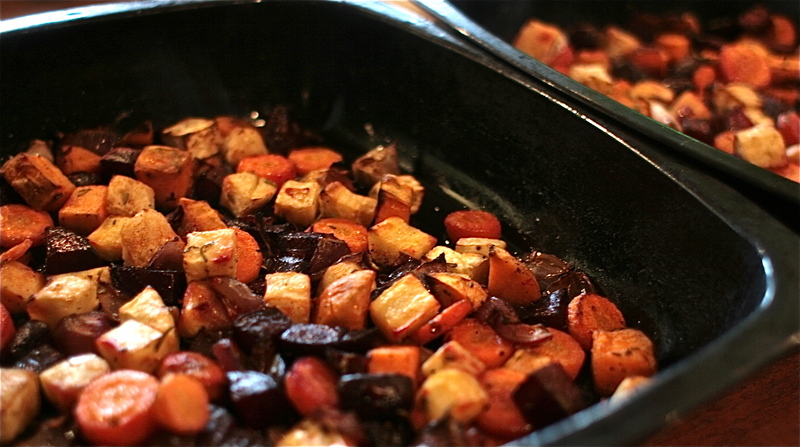 Place all the veggies in a roasting tray. 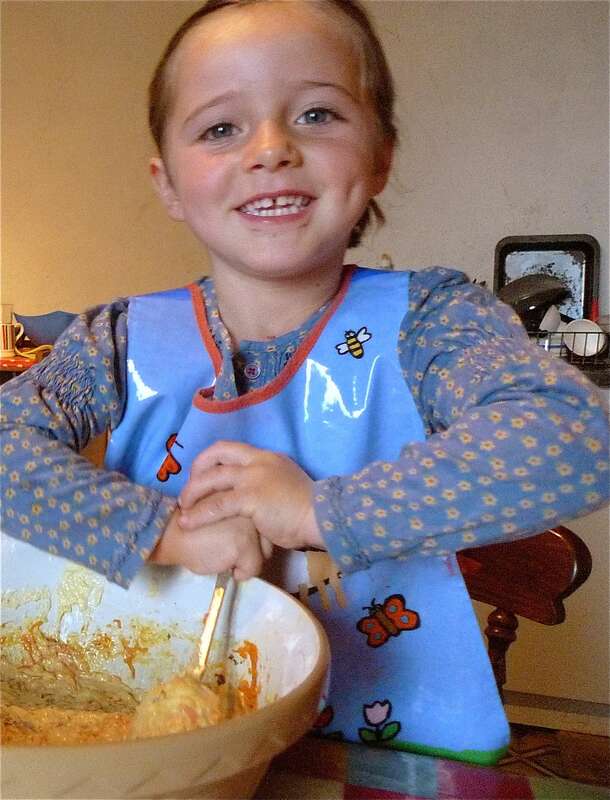 Stir in a tablespoon of the olive oil and a generous pinch of salt and black pepper (go easy on the salt for littlies). Bake in the hot oven for 20 minutes. 4. Mix the remaining tablespoon of olive oil, lemon juice, Dijon and oregano in a bowl big enough to easily house all the veggies. 5. 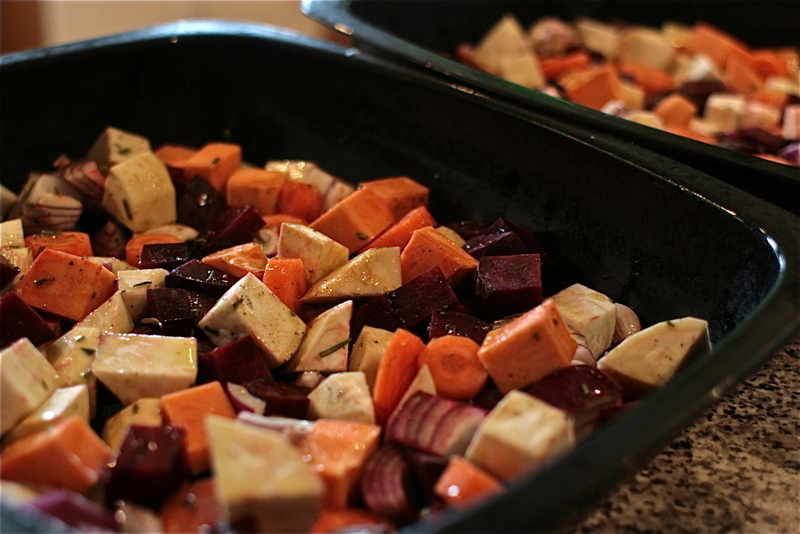 After 20 minutes remove the veggies from the oven and place in the bowl with the marinade. Ensure they have an even coating and leave to marinate until you’re almost ready to barbecue. 6. Cut your Halloumi into similar sized chunks to the veggies. 7. 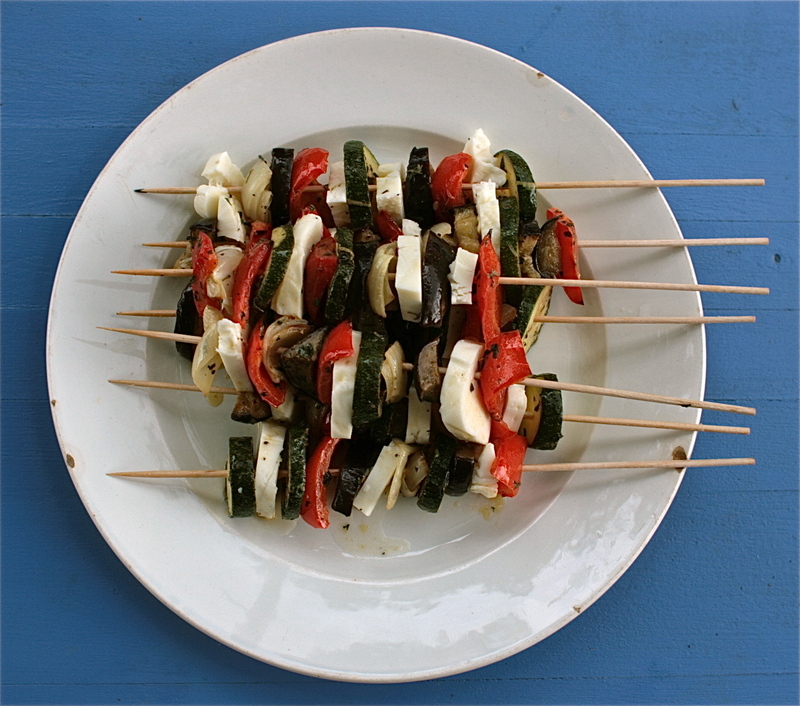 When you’re ready to barbecue thread the veggies and Halloumi onto your pre-soaked bamboo sticks or metal skewers, alternating between each component. 8. 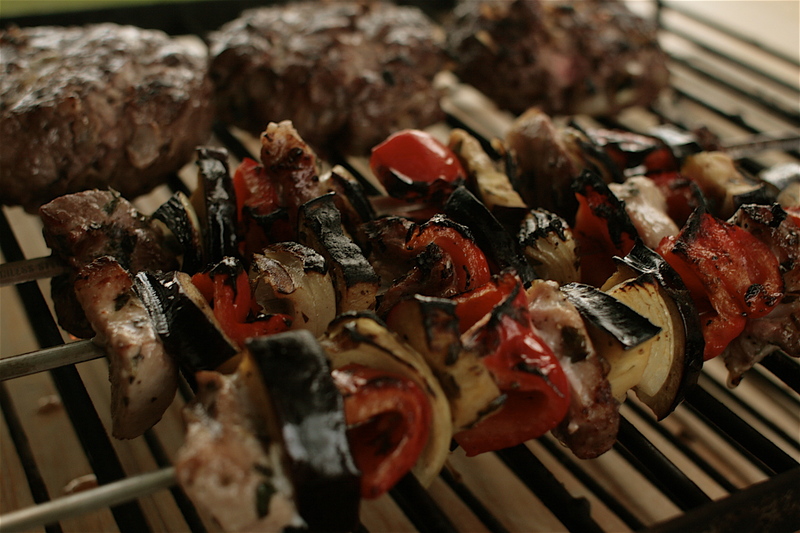 Cook the kebabs on a hot barbecue (or under a hot grill) for 4 to 5 minutes turning frequently. The cheese should be golden. Jacques for once without a silly face. But very excited about the prospect of his forthcoming barbie fodder! Never much time to snap a photo before little hands start grabbing! 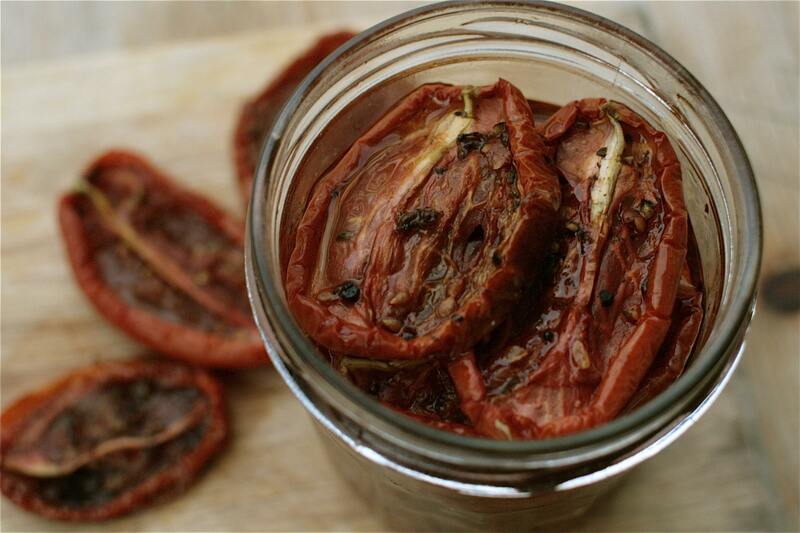 Homemade Sun (aka Oven) Dried Tomatoes! As regular readers will know it’s been a tomatoey summer at Chez Foti, and I have to admit my interest is now waining slightly. Though my 68 plants (beyond ridiculous I know, but down to an over-exhuberence in seed sowing and an ever growing number of fruitful self-seeders!) are most definitely not waining and unlike last year there’s not a diseased leaf in sight. And I’m not sure whether to laugh or cry at this! Of all the ways to attack a glut of tomatoes this is without question my favourite. Many a batch has been made and enjoyed over the course of our summer, and I’ve just realised I’ve not blogged how to make them. And lots of people have been asking. But beware they’re fabulously addictive. I’d hate to know how many I’ve consumed the last few weeks, but I can promise you I won’t ever be buying another shop bought jar again. The homemade ones are simply sublime beyond sublime. And I’d go as far as to say they are the single most tastiest thing I’ve EVER made! 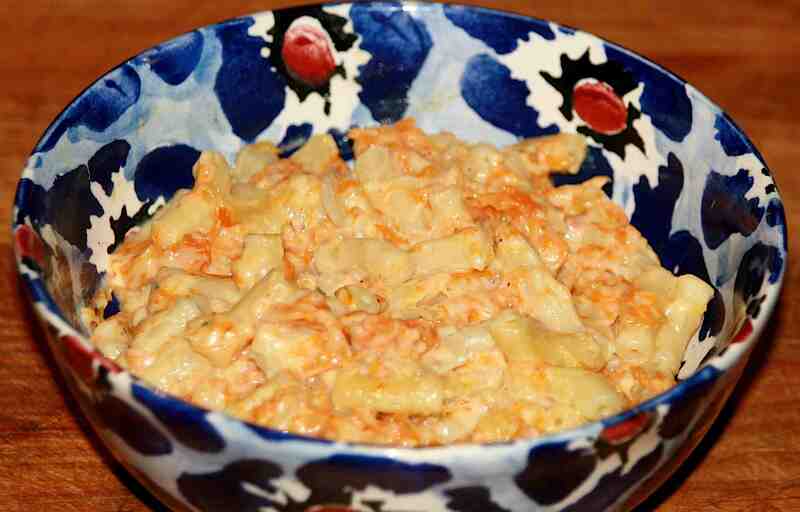 Amazing in pasta dishes, sandwiches, pizzas, salads, or served as an antipasto with drinks. The latter being my favourite way so you can truly appreciate their flavour (if stored in the fridge make sure you serve them at room temperature). I have to admit I’ve not made mine in the most orthodox way. 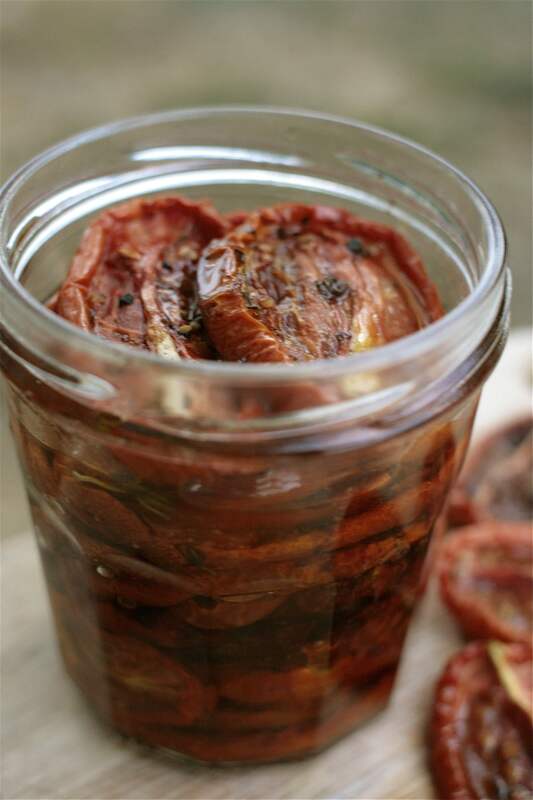 After much googling it seems that few people bother with attempting real ‘sun’ dried tomatoes as it’s a pretty tricky and lengthy affair, even if you do have guaranteed hot sunshine for several days. 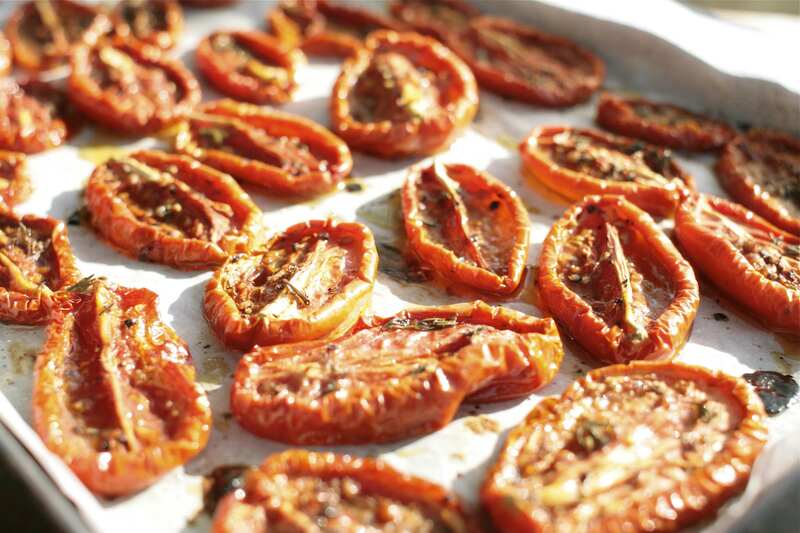 Pretty much all commercial ‘sun’ dried tomatoes are oven dried, as are the home produced ones. 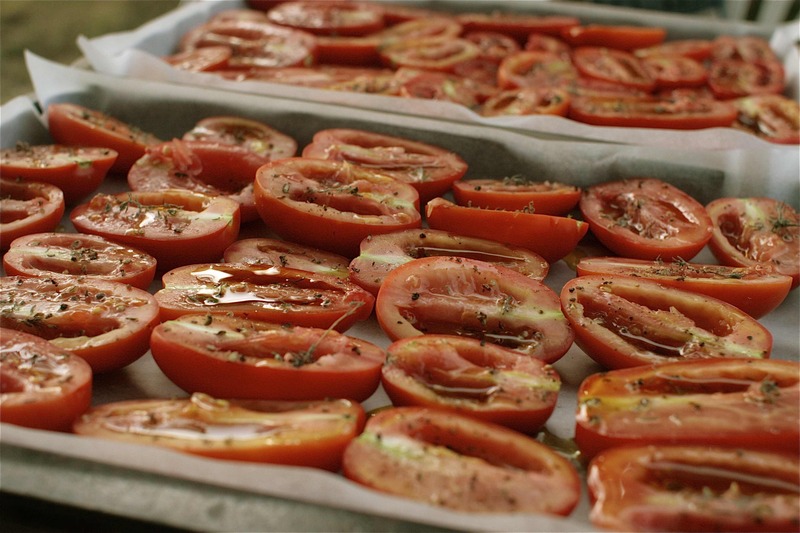 So an oven is required, but all searches on google required an oven that would heat to a mere 100 to 120°C (and to bake the tomatoes for around 6 to 12 hours, depending on their size and water content). My temporary gas oven most certainly goes no where near this low so I improvised. By placing the trays in the coolest part of the oven and periodically switching the oven on and off to it’s lowest setting over the course of 24 hours (admittedly I wasn’t dedicated enough to do it through the night!) I’m pretty confident I achieved the same results. And it shouldn’t go without saying saved a good deal of energy on the normal method. A total success. 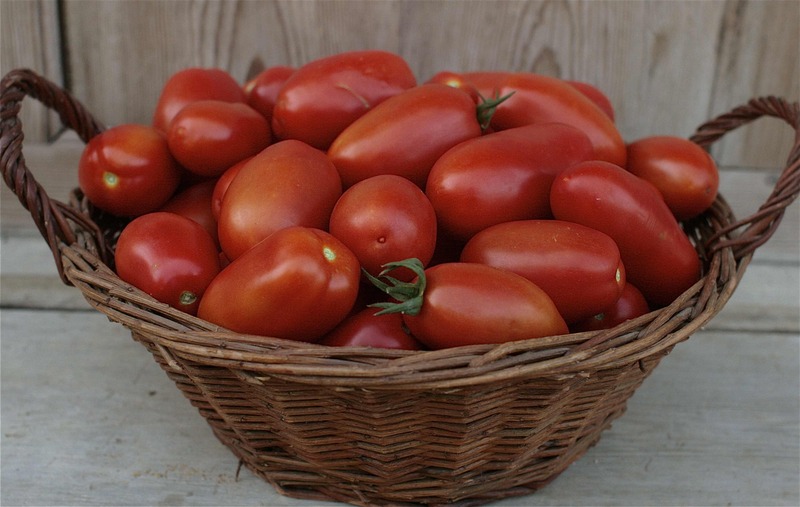 My other googling find was that plum (also known as Roma) tomatoes work the best, mainly because of their lower water and seed content and larger proportion of fleshy bits. Handily I’ve lots of those! Pre-heat your oven to the desired choice of heat setting. Cut each of the tomatoes in half lengthways. Using your finger carefully scrap out most of the juice and seeds. Place each cut side up on a baking tray lined with baking parchment. Continue until all the tomatoes are halved and prepared. I do at least a couple of trays at a time, but this is an awful lot of tomatoes! Sprinkle over the merest amount of black pepper, sea salt and sugar on each tomato half. Drizzle on a tiny amount of the olive oil and a generous sprinkling of thyme. Place in the coolest part of the oven and bake according to your chosen heat setting. 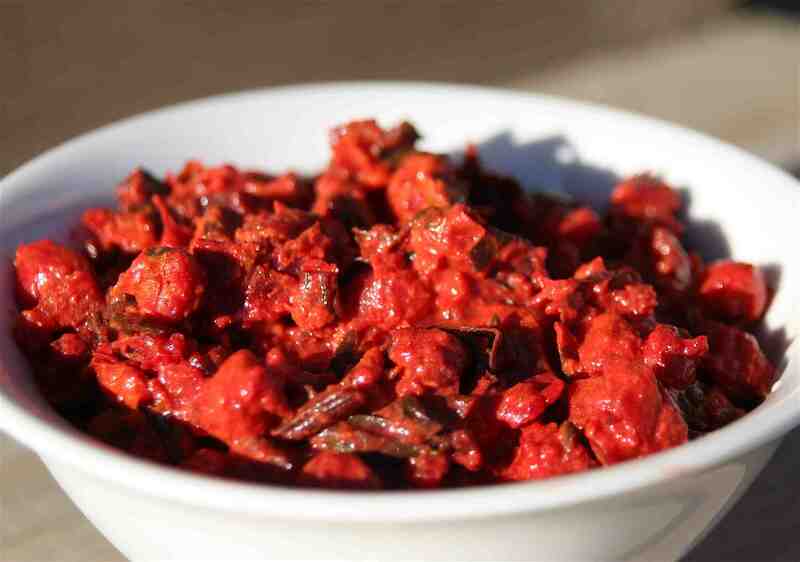 The sun dried tomatoes are ready when the liquid has evaporated, they are considerably reduced but are still flexible to touch, a very deep red and are a little chewy or tacky. The best way to judge them in my view is to taste a couple every now again! You’ll know when they’re perfect. I stored mine, once cooled, in a jar of olive oil with a few slivers of garlic, in the fridge. They also kept very well for several days in the fridge just plain. Believe me you won’t be able to keep them long anyway! Try not to eat them straight out of the fridge, let them warm to room temperature first. 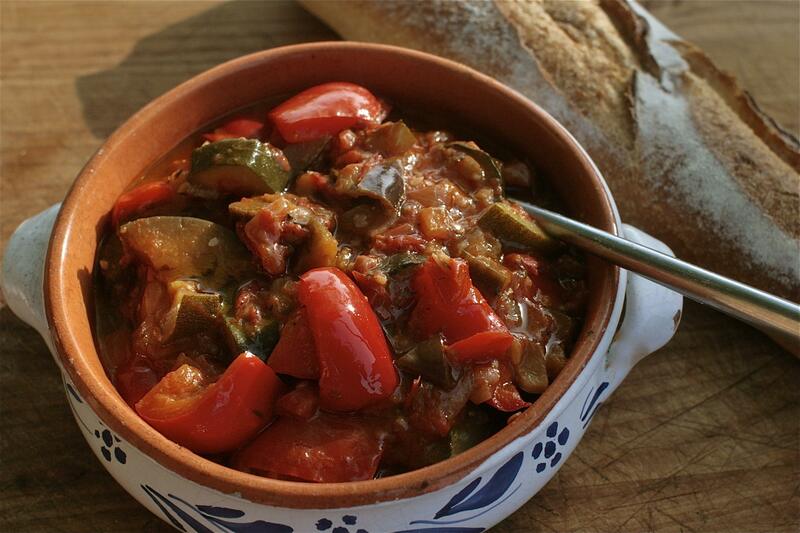 We love ratatouille at Chez Foti, and it’s a regular feature on our dinner table throughout the summer. 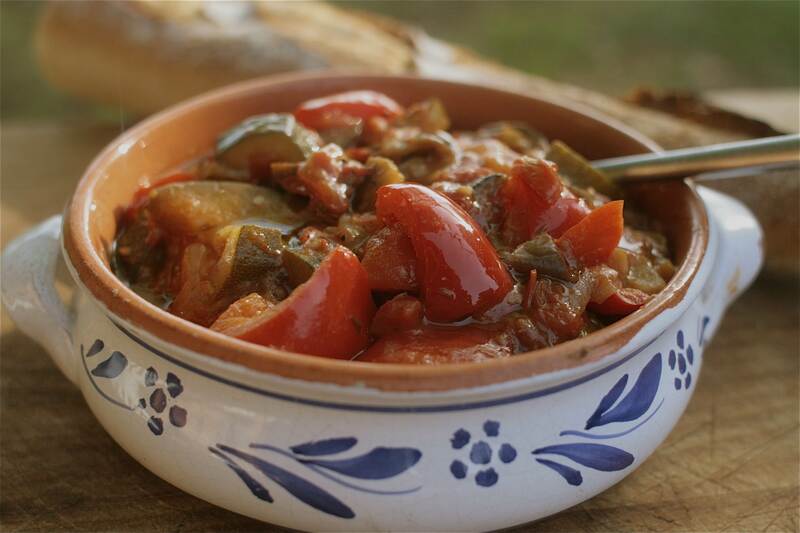 Originally from Provence, it’s a classic Southern French veggie side dish, and made with good quality (preferably organic) tomatoes, peppers, courgettes and aubergines it’s utterly delicious and bursting with vibrant summer flavour. 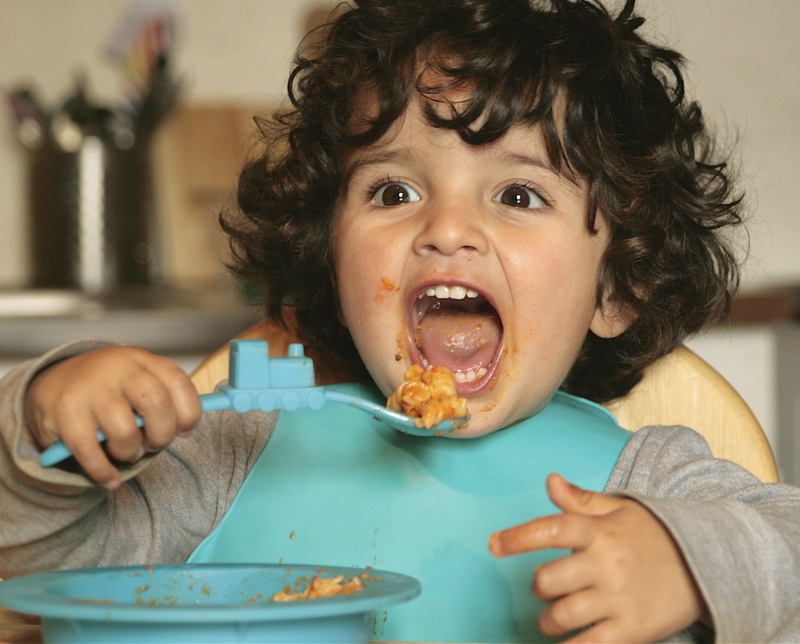 My kids have always loved it too, they eat it these days on a bed of pasta or couscous with a few cheesie sprinkles (they LOVE their sprinkles!). Last summer when they were considerably smaller (and fussier) I diced all the veggies to a smaller size, as large chunks seemed to put them off. And when Jacques was really tiny and weaning I whizzed up my ratatouille with a stick blender and served it to him with baby pasta stars. If you’re making for babies or little kids do not add any salt. Us grown up folk prefer to eat our ratatouille in a large shared bowl (with a luxurious drizzle of extra virgin olive oil over the top) with plenty of fresh bread and maybe the odd sneaky merguez sausage on the side. 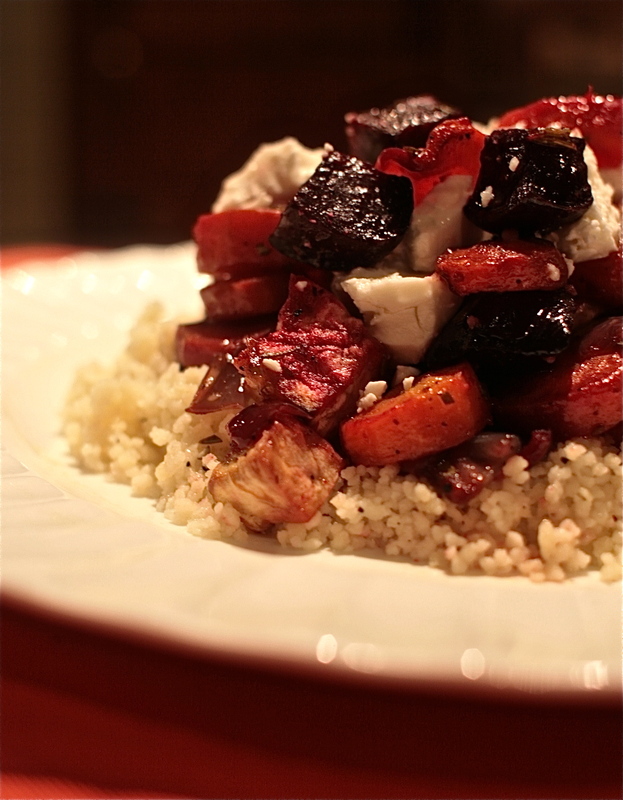 It’s great served as a veggie side dish to a roast or cold cuts too, or with pasta or couscous like the kids. My ratatouille recipe is probably somewhat old school now, in that it’s made as I’ve always made it with all the veggies in one big pot. 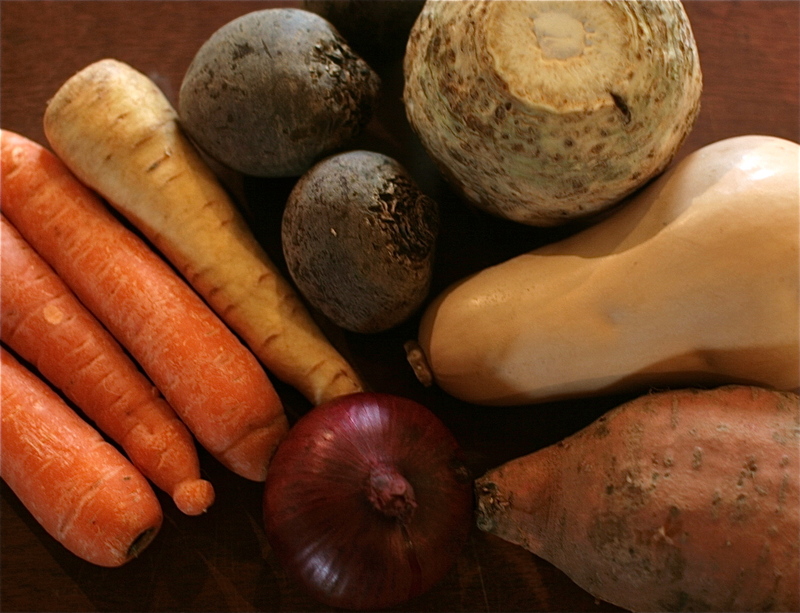 It seems that most modern recipes call for the roasting or sauteing then layering of each of the veggies separately and diss my old fashioned all-in-one stew method. I personally like it both ways, but Mr F (who’s a big ratatouille fan) and the kids prefer this one pot wonder way….which is also quicker and requires less washing up! Like all our dinners over the summer the veggies were all freshly picked from the garden, though admittedly I had to buy some peppers as mine are very slow to fruit this year. The courgettes, tomatoes (well obviously! 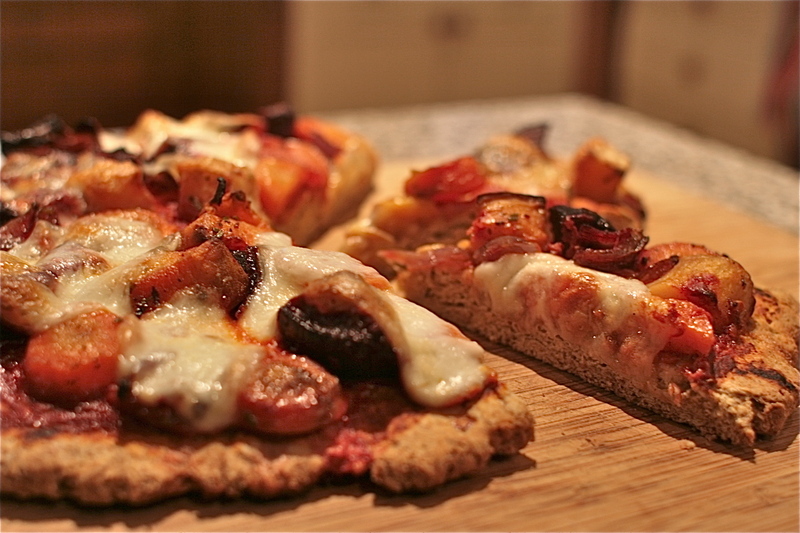 ), aubergine, garlic, onions, thyme and bay were all Chez Foti. 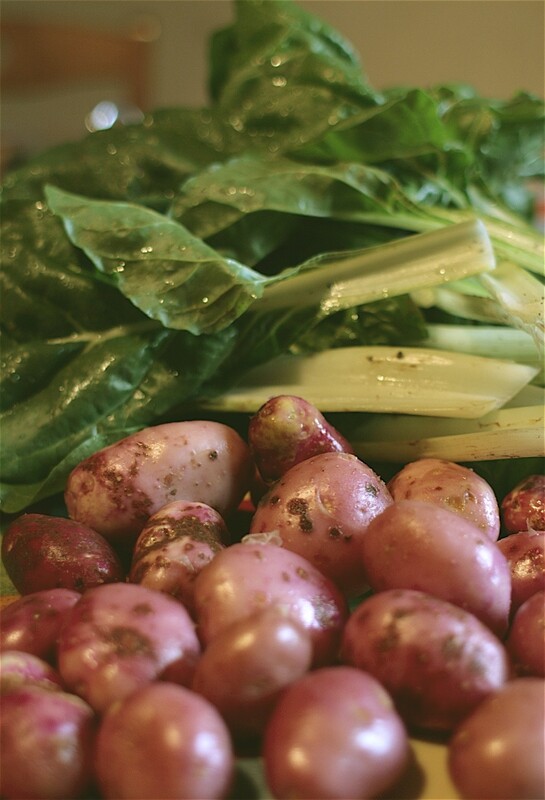 It really is rather special being able to walk out of the front door and pick all your dinner’s ingredients, and after a year and a half of growing my own the novelty most certainly isn’t waining. And I hope it never does. 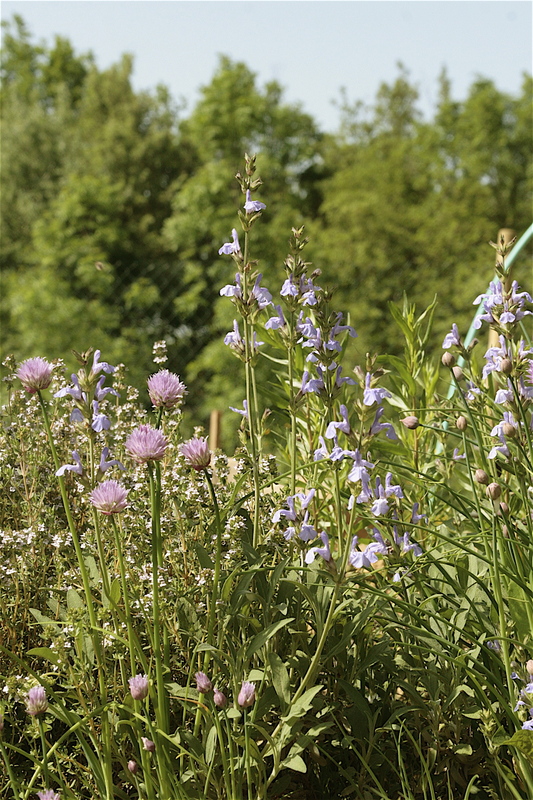 I’m entering this blog to the lovely Herbs on Saturday challenge, held by Karen at Lavender and Lovage. Dice your veggies. If cooking for bigger kids and adults try to cut the peppers, aubergines and courgettes to a similar 3 cm ish slice size. I slice the aubergines into rounds (of about 4 to 5mm thick) then quarter the slices (or eighth if very large). The courgettes are sliced to the same thickness then cut in half (or quartered if very large). 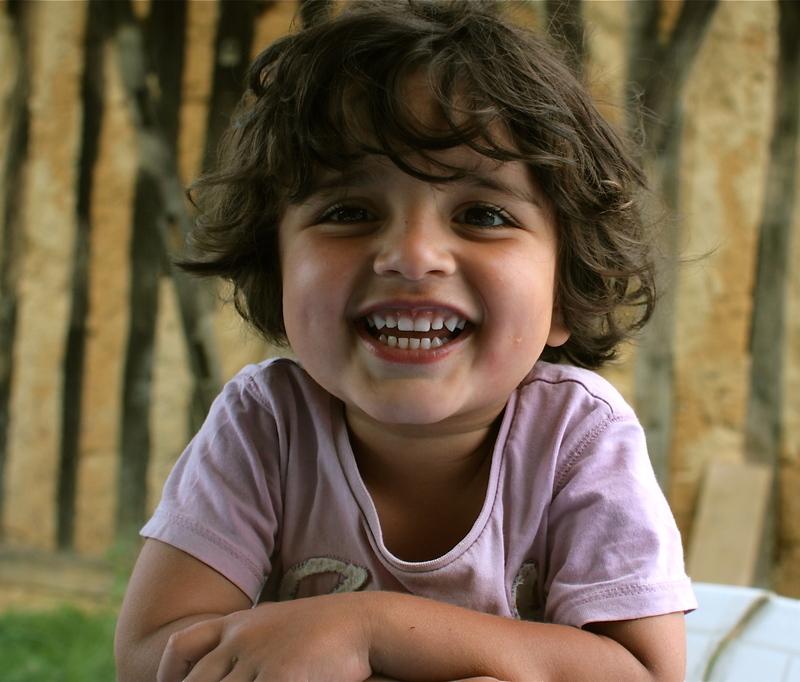 If making specially for babies (that do lumps) or toddlers cut to a much finer, more acceptable to them, dice. 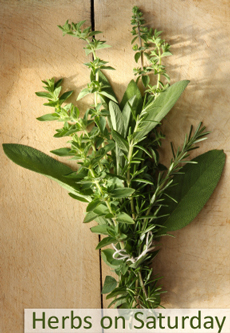 Make a small bouquet garni of the herbs by tying together the bay leaves and thyme sprigs with string. Heat the oil in a large saucepan or casserole. Add the onions and saute on a medium heat for 5 minutes. Then add the garlic and allow to cook for a further minute. Next throw in the aubergines and peppers followed by the courgettes about 5 minutes later. Stir frequently so nothing catches. Pour in the white wine (if using) and allow to simmer for a few minutes until much reduced. Now stir in your chopped tommies, bouquet garni, sugar, a generous amount of back pepper and salt (go easy on the pepper and no salt for babies and small children). Bring everything to a simmer, stirring from time to time, and allow to cook on a fairly gentle heat for about 45 minutes partially covered with the lid. The veggies should be very tender and tomatoes much reduced. Have a final taste check, adding more pepper, salt and sugar to taste (no added salt for babies or small children though). Fish out the bouquet garni and serve hot or cold. Eat and enjoy as you so desire! 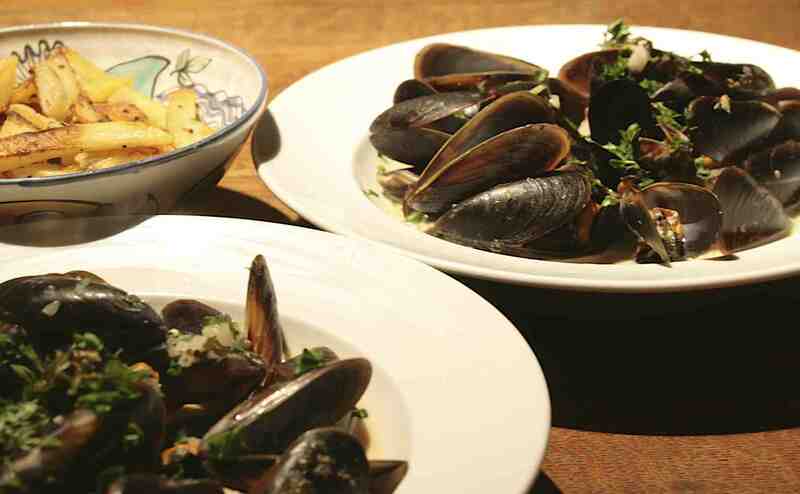 How about trying some of my other summery recipes? Garden Pasta, Tagliatelle with Cherry Tomatoes & Mascarpone, Paella, 70s Flashback Stuffed Marrow or A Couple of Tomato Tarts? Last night we had our lovely friend Debbie over for dinner and coupled with the welcome opportunity of an afternoon sans les enfants I got busy and inventive in the kitchen with our enormous glut of courgettes. Don’t ask me how but I’ve ended up with nine plants this summer. Last year’s seven were excessive despite our stream of guests the entirety of the courgette season. Yesterday afternoon I was immensely satisfied to use six of the beasts in a three course courgette dinner, and almost get on top of the growing glut. 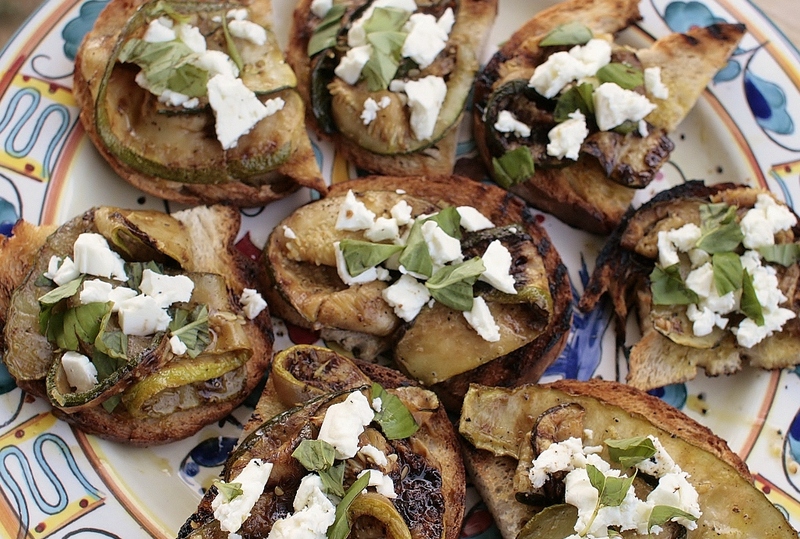 Heavenly bruschetta topped with griddled and marinaded courgettes with lemon, feta and basil to start, followed by a chicken, courgette & chard thai green curry. The curry being a very rare treat as its nigh on impossible to get most of the ingredients here in rural France, but I happened to have a sudden success in homegrown coriander and some recently imported goodies from the UK. Recipe to be blogged shortly. Dinner was finished off rather surprisingly with a green tinged, utterly delicious and moist courgette cake, sandwiched with homemade lemon curd and topped with lemon cream cheese frosting! I’d love to take the glory for the cake but in truth it’s Nigellas from her Domestic Goddess book. By the way, just in case you hadn’t guessed it, my Veggie of the Month for July is the not so humble courgette. I’ll be reviewing all my courgette recipes and ideas later in the month in a special courgettie round up. In the meantime I’d love to hear your interesting or novel courgette recipes and if I get a chance I’ll try them out before the round up. Anyway, back onto the Bruschetta. 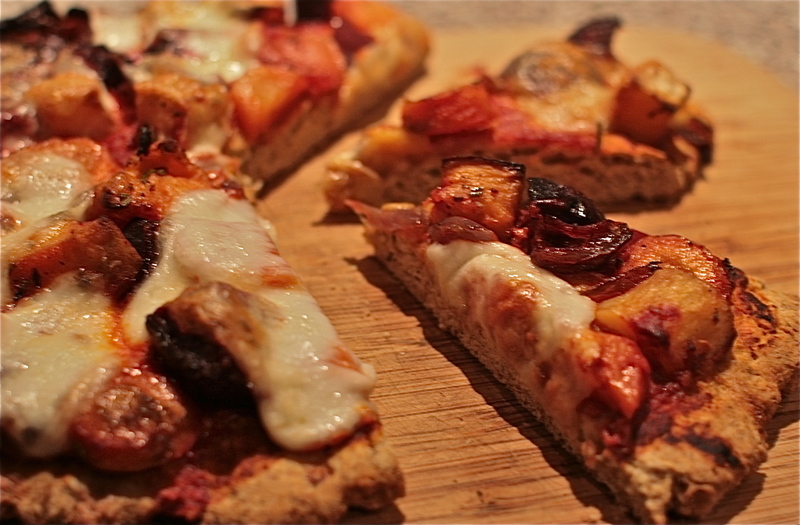 I’m a big bruschetta fan, and this has to be one of my favourite toppings. And so lovely to be able to not only glorify the courgette but my homegrown basil that’s finally big and grown up enough to be picked (considerably later than last year). Griddled or barbecued in lemon juice, extra virgin olive oil and plenty of black pepper, marinaded in a little more oil, juice and zest and topped with salty feta and torn basil leaves this is to me the essence of summer, and an extremely tasty starter or entree. I regularly griddle or barbecue courgettes in this way, without always the further marinading, to serve as an interesting veggie side, pizza topping or pasta addition. 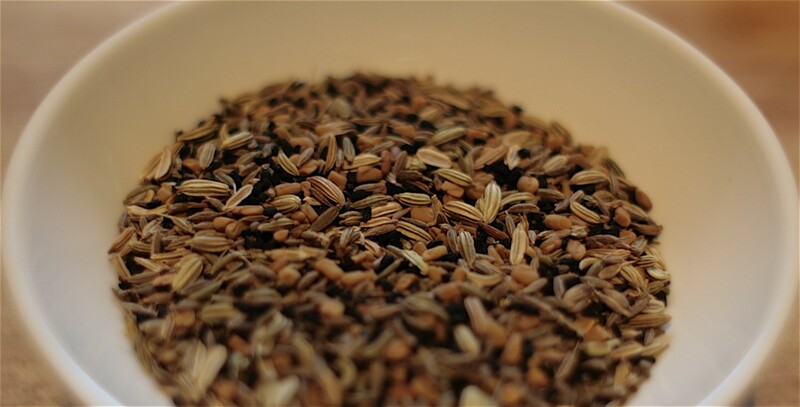 I’m entering this post to Lavender & Lovage’s Herbs on Saturday blog challenge, held this month by the lovely Vanether at Bangers & Mash Chat. Fire up the barbie or place your griddle pan on a high heat. Slice the courgettes lengthways into thin strips 2 to 3mm thick. Mix two tablespoons of the olive oil, half the lemon juice and the salt and pepper in a bowl. 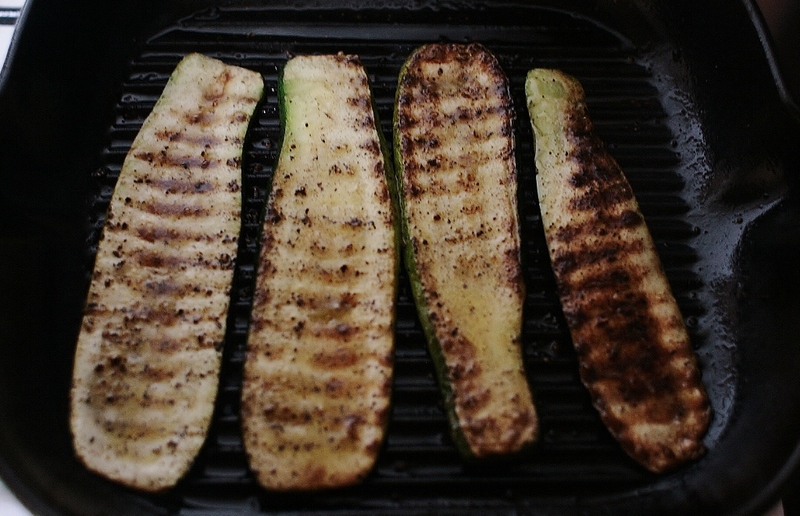 Dip each courgette strip into the above marinade and place on the hot griddle. Allow to cook for two or three minutes until coloured and soft on each side. When cooked on both sides remove and place in another bowl and start up another batch until all are cooked. On to the cooked courgettes pour the rest of the marinade, a little more lemon juice (to taste), the lemon zest and another wee drizzle of olive oil. 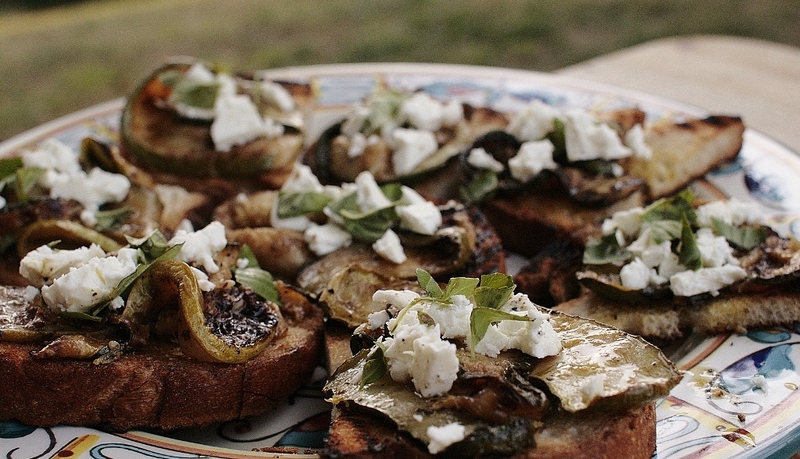 Give everything a good stir and leave to marinade until you’re ready to make the bruschettas. In the same griddle pan or barbecue toast the bread until coloured on each side (this again will take several batches). Cut the garlic clove in half. As the hot toast is removed from the griddle rub the cut side of the garlic over the hot surface of the toast to impart a little flavour. Drizzle over a little olive oil. Top with a couple of slices of the marinaded courgettes, a little crumbled feta and a few pieces of torn basil and eat immediately. As if you could resist. ‘Tis barbie season finally and we’ve been making the most of it this week, partly because of the great weather and partly because we’ve had our seventeen year old nephew James staying with us. I’m not terribly sure how we’re going to cope without his super-nannying skills when he leaves this afternoon (both with kids and dogs!). I’ve mainly been doing a few of my usuals on the barbie, various veggie and meat kebabs, my fat b*****d blue cheese stuffed burgers, chilli pork chops etc, all recipes that I’ll be blogging shortly plus a few exciting newbies on the block. For today it’s my Greek Stylie Pork and Veggie Kebabs with fresh oregano. I’ve no idea how many times I must have made these last summer. At least twenty times I’m reckoning, and later in the summer using peppers, aubergines, courgettes and onions fresh out of the garden. I can’t wait to be able to do that again, rock on summer! They tend to be more of a side dish rather than a main event for me, but served with hummus and/or tzatziki, a greek salad and pitta bread they make a very substantial main. Great also with chicken instead of pork or without any meat at all (just up the quantity and variety of veggies). The meat and veggies are best left to marinade for a good few hours, so try to make in advance if you can. 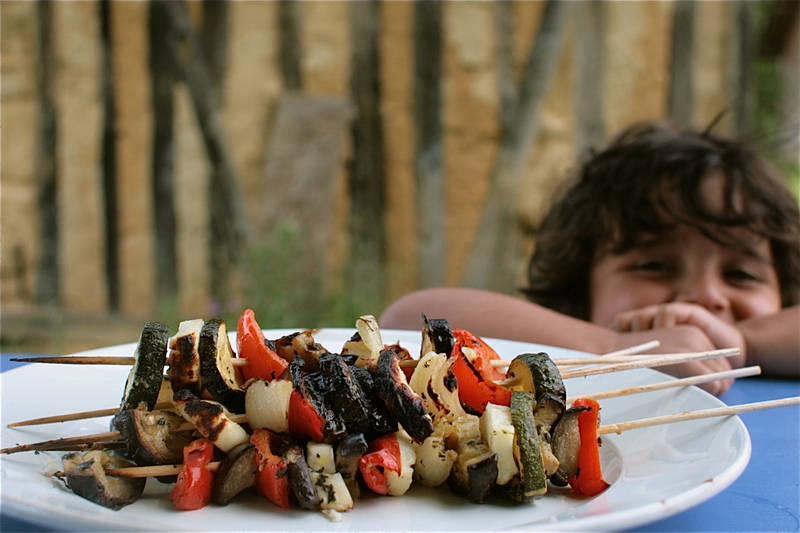 And if you’re short on time, as I always am, it’s particularly handy to get all the hard work done in advance anyway, then all you have to do is a bit of skewering up just before barbecuing. 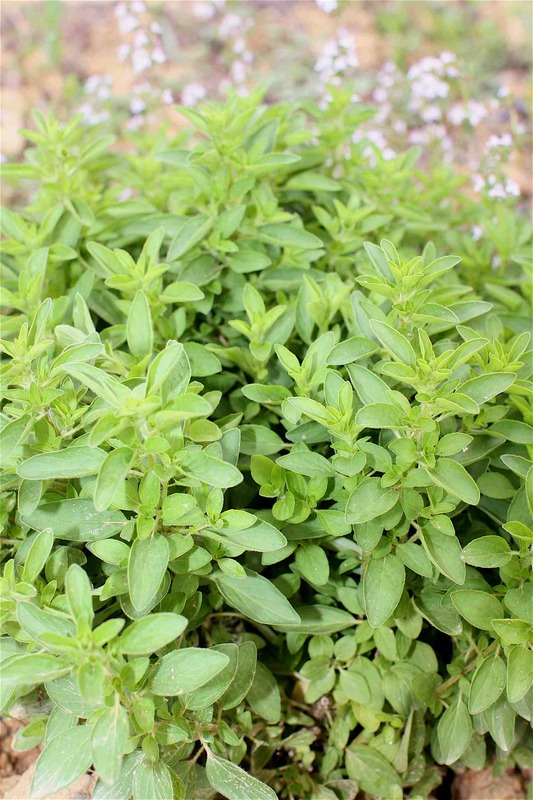 As I grow oregano in abundance I love to use it as generously as possible. It’s the chief flavouring in these kebabs, but if you don’t have a source of fresh oregano you can replace with three teaspoons of dried. 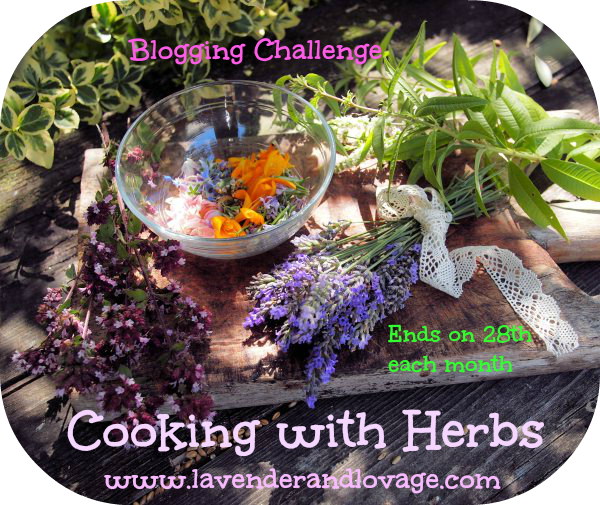 I’m entering this post to the Herbs on Saturday blogging challenge held by the lovely Karen at one of my favourite blogs, Lavender & Lovage. I’ve been meaning to take part for quite a while now, but my organisational skills are not the best at times! Have a look at her blog as there’s sure to be plenty of herby and other delights on offer. If you do lots of barbecues I’d think about investing in some metal skewers, they’re so much better than the flimsy easily burnable throw away ones. My Mum and Dad gave me a set years ago that they’d brought back from Istanbul. To be honest they sat at the back of a drawer unused for some time before I got into barbecuing recently, and now they’re used countless times every summer. 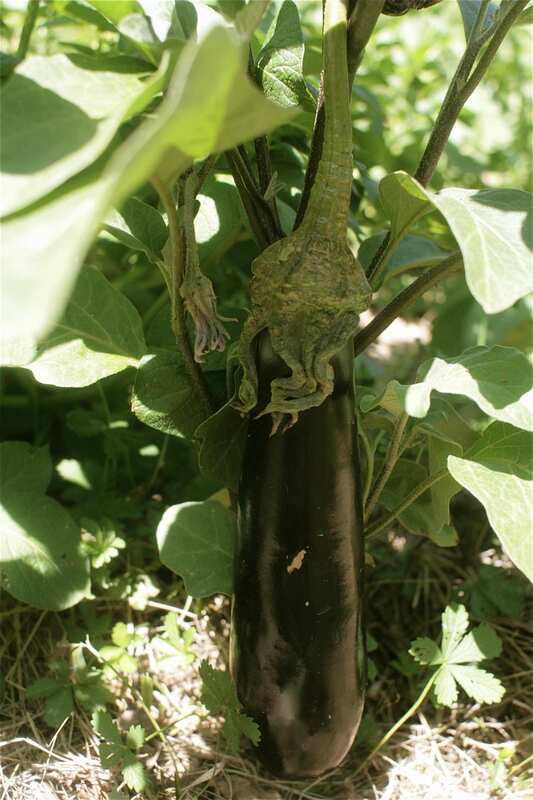 ½ an aubergine or a small courgette or both! Start with preparing your meat and veggies. They should all be cut to a similar size so everything cooks fairly evenly. Half the onions, then half again then again into eighths. Then roughly separate the layers. Cut the aubergine in quarters lengthways then slice into pieces about 6/7mm thick. If using courgette slice into 6/7mm thick rounds. Cut the pepper to a similar size. Finally dice the pork the same size as the veggies. 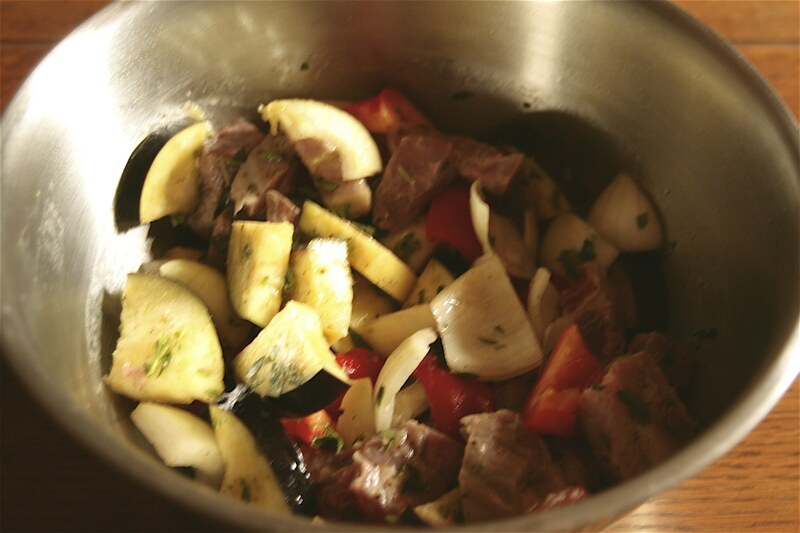 Now put together the marinade ingredients in a large non-metalic bowl, mix together the olive oil, lemon juice, garlic, salt & black pepper and oregano leaves. Tip the pork and veggies into the marinade and give everything a thorough stir. I use my hands. Cover with cling film and leave to marinade away in the fridge for a few hours. 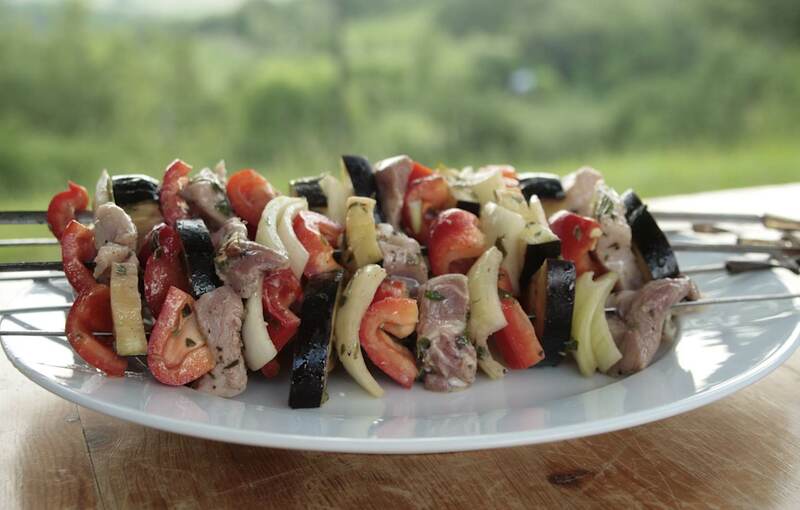 Just before barbecuing, remove from the fridge and skewer up, alternating the veggies, onions and pork. Brush any remaining marinade over the kebabs. Cook on a hot barbecue, turning every few minutes until they’re evenly browned on all sides and the pork and veggies are thoroughly cooked through. Great served hot with pitta breads, hummus, tzatziki and a large greek salad on the side (again made with plenty of lemon juice and fresh oregano) or as a side dish to the rest of the barbecue. Any leftovers are fab eaten cold in a pitta sandwich. 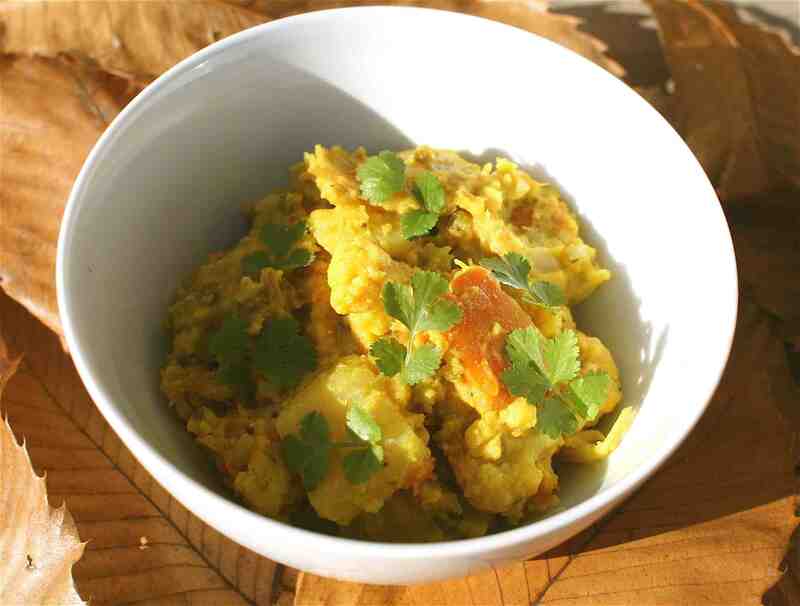 Aloo Gobi Kaddu – Potato, Cauliflower and Pumpkin Curry! 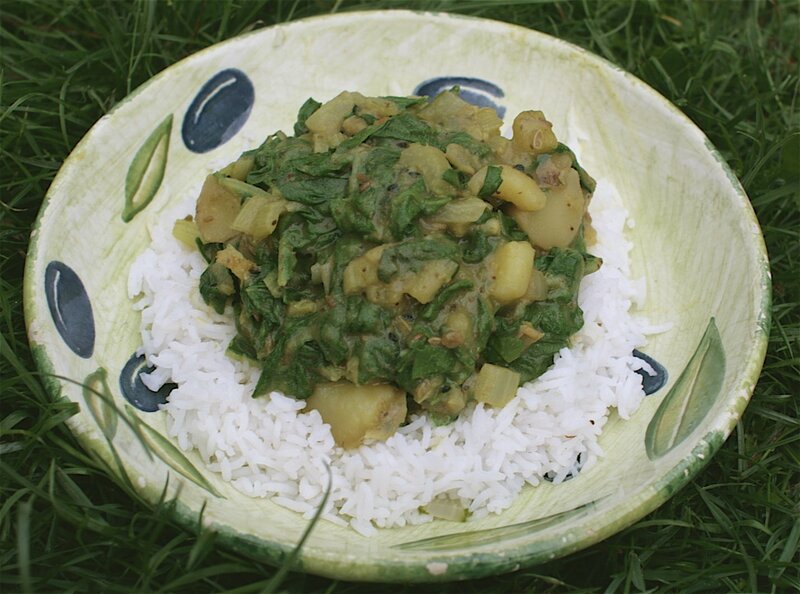 I love veggie curries. Even though I’m a meat eater I’ve always loved, and usually preferred, the veggie sides when it comes to Indian food. A few days ago when faced with a very empty fridge bar one huge cauliflower and half a pumpkin I thought I’d make a veggie curry. Aloo Gobi, a curry of potatoes and cauliflower is one of my all time faves, a wonderfully comforting combo, and definitely my favourite way of eating cauliflower (even above cauliflower cheese which I adore!). I thought I’d try it out with pumpkin too, Kaddu in Hindi, and it really was rather a delicious combo. 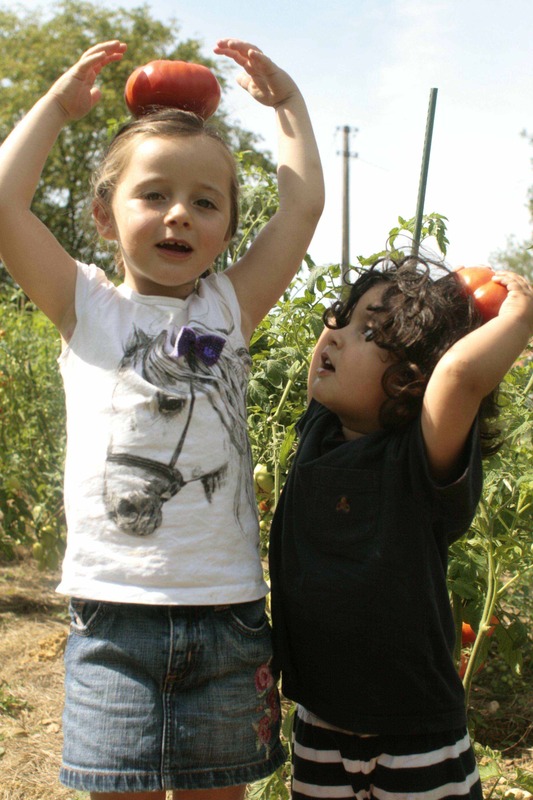 I’m also happy to report that both the kids loved it too, in fact rather surprisingly after ten days of being a little ill and only picking at his food Jacques really tucked in….even with the addition of a couple of dried chilis!. 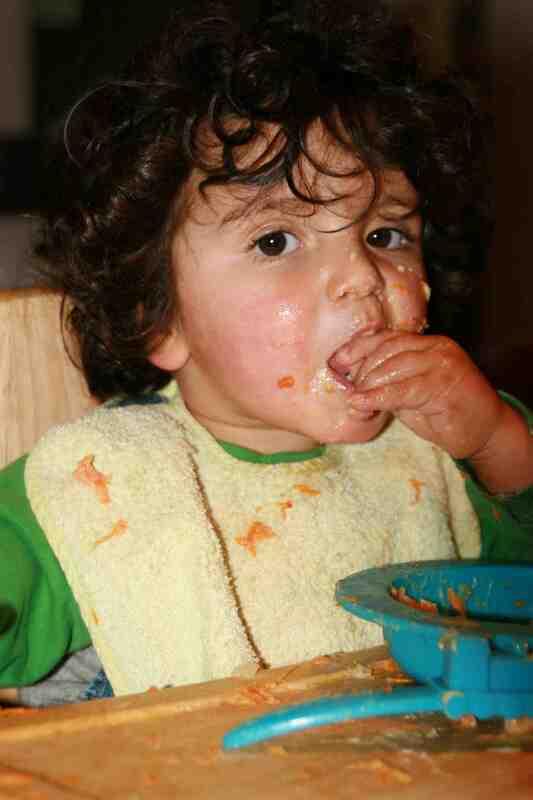 I think it’s a good thing to get your kids eating a touch of chilli at an early age, then there’s no great surprises or aversions when they’re a bit more grown up. 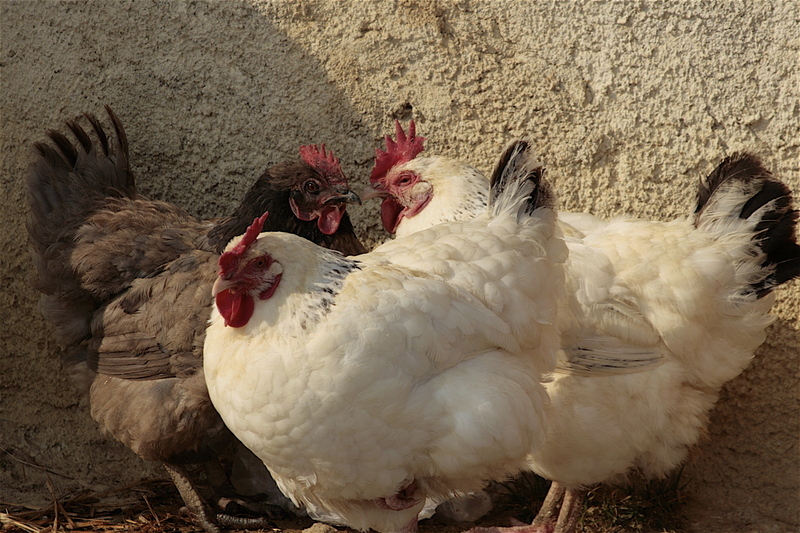 Mine definitely have a taste for a little heat and spice, but then they were weaned on lots of yummie lentil dahls. 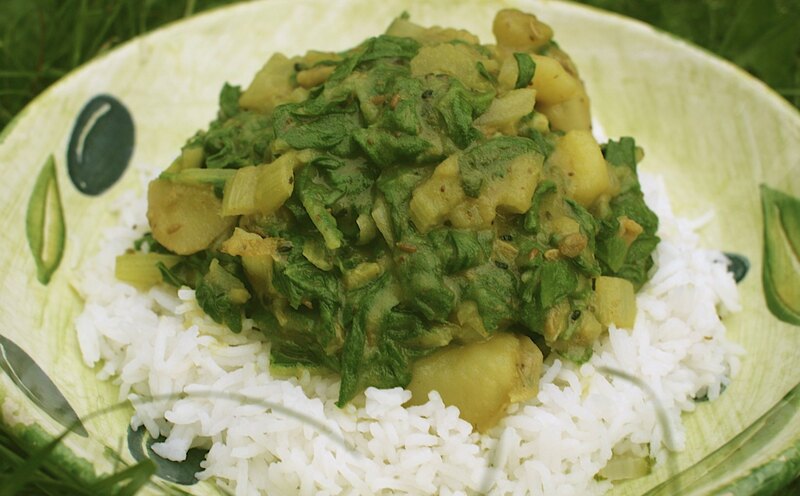 You could either serve this as a meal in it’s own right, as I did, with some plained steamed basmati rice and chapatis on the side, or as a veggie side accompanying a larger meal. In a large saucepan heat a little sunflower oil and add the onion. Cook over a gentle heat for about 10 minutes, stirring occasionally, until translucent. Add the chilli, garlic and ginger to the pan, along with the curry powder, turmeric and onion seeds. Cook for a couple of minutes, stirring often. Add the potatoes and ground almonds. Stir well. Add the sultanas and 350ml of water. Bring to the boil and simmer for about 5 minutes. Add the cauliflower, pumpkin and coconut milk. 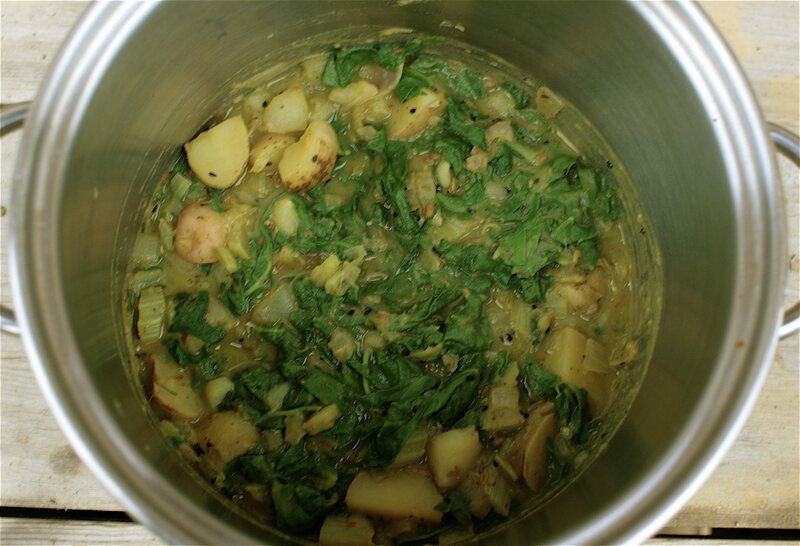 Continue to simmer for 30 to 40 minutes with the saucepan lid on, until the potatoes and veggies are all very tender. Stir in the lemon juice and coriander. Taste and add salt to suit.